Our Wishon Pro Shop, below, is backed up by over 14 years of custom fitting golfers with Wishon heads and our recommendations for the right shafts. We are a Certified True Temper Fitting Center, offering all true temper products, including tour models, a Certified Rifle Center, offering the Rifle Blank option for a true fit, a Certified ACCRA Fitting Center, offering their full line of excellent shafts. Notes: All prices are in CANADIAN DOLLARS, taxes extra-if applicable, f.o.b. Woodstock, Ontario, Canada. Includes your choice of grip, and we recommend Winn Grips or Golf Pride. To Order: WE do not Use or Like any internet based payment system. We cannot custom build a club or clubs thru you filling out a form. Building a custom club for you is very personal, and we strive to get it right! 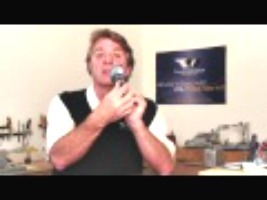 Therefore we request you either email us @(rmckinney@rogers.com) or call 226-785-1396. The 919THI can be ordered in any loft from 8* to 16* in half degree increments-in any lie angle from 4* upright to 4* flat of the 59* lie design spec-in any face angle from 4* open to 4* closed from each model’s face angle design spec. Variable Thickness Face with High MOI delivers the best off center hit performance in the game. 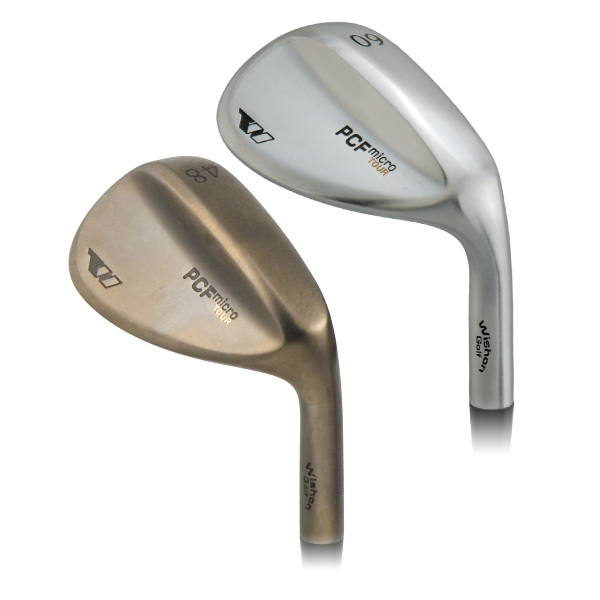 HS 300 high strength steel thin face allows for high COR for increased ball speed. Reduced face-to-back sole width narrows the sole to ground contact for more consistent contact with the ball, even from the rough. 929Hs available in black gloss finish in RH #2-12*, #3-14*, #4-16.5*, #5-18*, #7-21*, #9—24.5*. LH #3-15*, #5-18.5*, #7-21*. 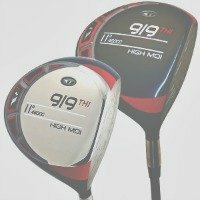 919F/D is a “multi-driver”, 260cc volume design for use off the tee on tight shot holes where control and accuracy is critical, designed to be built to lengths between 42” and 44”. Maximum COR face design for no distance loss compared to any large titanium driver head. TWGT Hand Select and Bending Services can deliver the 919F/D in lofts from 10* to 15*, lies from4* up to 4* flat and face angles from 4* open to 4* closed. Available in RH in 11* and 14* lofts. Thin, High COR, High Strength HS350 Steel Alloy Face offers higher ball speed for more distance in a hybrid head design. Available in RH in #2-18*, 3-21*, 4-24*, 5-27*, 6-31*, LH in #3-21*. Golfers believe, correctly, that consistent performance is significantly improved by the use of a matched set of clubs. The term “matched set” truly means that all the clubs in a set only require the same exact effort and feel when they are swung. All of the clubs are the same length. Lengths: 6 foot golfer: 39.5” Others: 36” to 41” fitted to your specs. All of the clubs use the same exact shaft and grip models with all of the shafts being of equal weight, length, and flex. Available in AA, A, R, S, & XS flexes. Available in R.H. only. 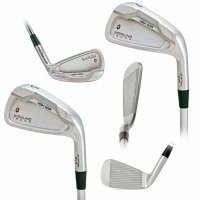 The lie angle of each club in the set would have to be the same since all clubs are made to the same playing length. Lies: 58* to 62* fitted to your specs. 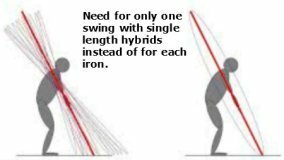 All of the club heads in the set weigh exactly the same with each head’s center of gravity in the same location from head to head, and identical face angle. If such a set of club heads can be obtained, the shot making ability of each club for spin and distance and trajectory will be controlled by loft alone. $199.00 CDN. each Set of 5: $ 899.00 CDN. Wishon Hybrid Graphite Fitted Shafts. Identical length and lie allow the golfer to use the same stance, same posture, and same swing plane for improved shot consistency. Single length construction ensures all possible elements of swing feel are identical for each club in the set – same MOI, same total weight, same head weight, and same balance point. Sterling Single Length wishon golf clubs can be built to 36.5”, 36.75 or 37” length for each club as fit for the golfer’s comfort and preference. High COR #5, 6, and 7 irons offer proper distance for the low loft clubs at the shorter single length. 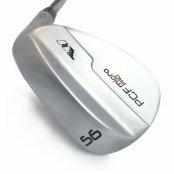 Conventional cast carbon steel in the #8 to gap wedge, with 5* loft increments, to offer proper distance gaps and proper distance, with the high loft clubs. Forged Carbon Steel + CNC Machined Deep Back Cavity for the Highest MOI in a True Forged Iron Design. Wishon golf clubs 2nd Generation 560 Series Forged Iron adds a more Solid On-Center Feel to the Best Off-Center Forgiveness in a Forged Carbon Steel Iron. New Center Cavity Half-Moon Weighting Increases On-Center Impact Feel While Offering a Very Slight Increase in Shot Trajectory. Low-Off set Design Also Features a Slightly Thinner Top Line than the Original 560MC. Completely CNC Machined Back Cavity Ensures Precise CG Position for Each Head Number with a Beautiful Cosmetic Appearance. Fully Radiused Tour Grind Type Sole Design – This is a Model for Scratch to Middle Handicap Players. Double Nickel Chrome Pearl Plated Finish with Glass Bead Blast Highlights – CNC Machined scorelines Within 2010 USGA Rule Guidelines. Available in RH Only 3 thru AW. 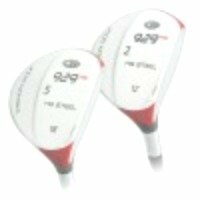 High 0.830 COR face design offers the most distance for all golfers. CNC Machined Variable Thickness Face delivers superb off-center hit forgiveness. 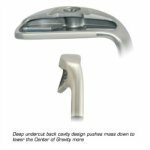 Head body material is 1020C carbon steel to allow club makers to perform a wide range in loft and lie bending – previously all high COR thin face designs had to be mounted in a 17-4 stainless body, which limited loft and lie fitting options. 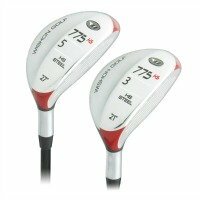 Conventional Head Size and Shape means a wider range of golfers will like the 771CSI design. Fully Radiused Sole Design with Rounded Leading Edge offers golfers the best playability from all types of grass as well as from the rough. Available in RH in #4, 5, 6, 7, 8, 9, PW, AW., LH in #4,5,6,7,8,9,PW. in bright satin NiCr electroplated finish. 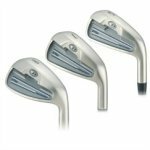 Game improvement, wishon golf clubs, investment cast, stainless steel iron design, with progressive blade height, and a semi-wide sole iron. Progressive blade height design graduates through the set from semi-shallow on the long irons to conventional blade height on the short irons to position the CG low on the lower loft irons but conventional on the higher loft irons. Semi-wide, symmetrical width sole design with face-to-back sole radius and blunt leading edge achieves clean, solid contact through all grass/turf conditions. Twin Weight Bores allow for a maximum headweight addition of 15g to satisfy any combination of custom length and shaft weight fitting considerations. Precision investment cast from 431 stainless steel for ease in loft/lie bending, finished in a bright satin finish with attractive cosmetic highlights. Traditional sole, classic round profile shape stands as truly superb overall shape with pleasing set-up behind the ball. CNC Milled Face with Wishon Golfs proprietary Micro-Groove™ scorelines to maximise every golfer’s ability to spin the ball. Tests with TrackMan® launch monitor verify a 1000rpm increase in spin rate compared to typical U-groove scorelines on a glass bead blast face. Conforms to USGA/R&A groove rules. Micro-Groove™ scorelines are more narrow and closer together than traditional scorelines. Micro-Groove design allows the edges of 5 lines to contact the ball at impact while traditional lines only allow 3. Wishon Golf’s proprietary Zero-Bounce heel grind ensures the leading edge of the face remains low to the ground when the face is opened for cut/finesse shots. Produced in a durable satin nickel/chromium electroplated finish. Available in both RH and LH, 52, 56, 60 degrees. $ 199.99 CDN. (all in), your choice of grip, RIFLE Spinner Steel Shafts. Accra Graphite shafts (request price) CUSTOM FITTED!!!!! Available in Bright Satin Chrome plating or Dark Nickel Platinum plating finish. Traditional, narrow sole, classic shape/profile stands as the finest overall shape and set-up behind the ball in a TWGT original wedge design. CNC Milled Face combines with TWGT’s unique Micro-Groove™ scorelines to offer the highest level of backspin available in a wedge design. Micro-Groove™ scorelines are more narrow and closer together than traditional scorelines – the Micro-Groove design allows the edges of 5 lines to contact the ball at impact while traditional lines only allow 3. Designed with wishon golf clubs unique “zero-bounce heel” – all the bounce has been removed from the heel area of the sole to allow golfers to roll the face open without raising the leading edge. A key to playability from thin grass and even hardpan. Available in RH Lofts of 52, 56, and 60 degree. LH available in 56 degree. 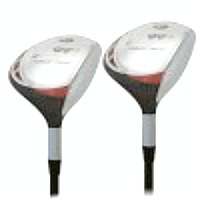 WISHON GOLF CLUBS are some of the finest designs in the Golf Industry!!! !